The 2014 UCI WorldTour kicked off with a thrilling and fiercely contested Tour Down Under which saw Simon Gerrans take his third overall victory by just one second over Cadel Evans. Simon Gerrans (Orica-GreenEDGE) seems to have mastered the art of hitting full gas as soon as the season begins. In 2012 he won the Australian National Championships, the overall Down Under and Milan-San Remo, while last year he won stages in Australia, Catalunya and the Basque Country before finishing on the podium at Amstel Gold. This season he’s again off to a flyer, earning his second national title before winning stage one and the overall here. With the focus of attention in the spring classics likely to be on Cancellara, Sagan and Boonen, watch out for Gerrans. He’s the kind of rider who can be competitive from Milan-San Remo right through to the Ardennes. Diego Ulissi (Lampre-Merida) isn’t yet a household name despite six wins in 2013, but he’s definitely one to watch. The 24-year-old is a strong all-rounder with a good sprint who reads finishes well. On stage two he sat patiently in the wheel of Astana’s Francesco Gavazzi before latching on to Cadel Evans, whose charge provided him with the perfect lead-out. Watch out for him in Paris-Nice (where he was seventh overall last year), as a dark horse in the spring classics and as a grand tour best young rider contender. You might have been forgiven for thinking the clock had been turned back a few years in Adelaide. Trek’s Jens Voigt – who at 42 is five weeks older than Chris Horner – featured prominently on stages three and five, putting in his customary crowd-pleasing effort in the day’s breakaways. Cadel Evans (BMC) will be ‘only’ 37 on Valentine’s Day, but despite a podium finish at last year’s Giro his continuing status as a grand tour contender has been questioned. We shouldn’t read too much into a stage victory in January, but it was fun to see him attack on Corkscrew Hill to win stage three solo. Sure, he was unable to hold on on Willunga Hill but second overall in a race lacking the long, grinding climbs he tends to favour suggests he’s in fine fettle. ‘Cuddles’ has never had the big acceleration on climbs or in sprints but the former world champion remains a gritty never-say-die rider who has won plenty of memorable races. Remember the mud-splattered stage to Montalcino in the 2010 Giro? Or edging out Alberto Contador on the Mûr de Bretagne in his victorious 2011 Tour? Crosswinds fractured the field on stage four, and Lotto-Belisol and Andre Greipel took advantage to claim the win. But look who was caught behind the split, ruining their day: Marcel Kittel and his Giant-Shimano squad. Is this becoming a habit? Remember stage 13 of the 100th Tour de France last year, when a similar split tore the peloton asunder? Mark Cavendish romped to victory, while the biggest victim of the crosswinds was … Marcel Kittel. Giant-Shimano have arguably the best sprint train in the field. But to set up the train, you first need to get to the finish. Some room for improvement here. Fantastic weather, fantastic fans and fantastic racing – particularly from the Australian riders and teams keen to show well at their ‘home’ race. The Tour Down Under is a well-organised event, and one where the inclusion of time bonuses allows the strong-man sprinters to keep pace with the climbers. Some question whether the race deserves WorldTour status. Personally I think it’s the perfect season-opener, particularly with this year’s hillier parcours encouraging more exciting finishes. It’s no longer treated as a gentle warm-up either. On a number of days we had passages where the peloton was charging into the base of a climb or a crosswind at a sustained pace of 60+ kph. These days teams come to Australia to race, and woe betide anyone who turns up still in winter training mode. 9 – Simon Gerrans’ overall victory represents the ninth win by an Australian rider in 16 editions of the race. 1 – In seconds, Gerrans’ final winning margin. The Australian won the 2012 edition after finishing on the same aggregate time as Alejandro Valverde. 3 – Gerrans is the first three-time winner of the race. Andre Greipel and Stuart O’Grady have each won twice..
11 – Discounting time bonuses, Cadel Evans rather than Gerrans would have won overall, by 11 seconds. 5 – The race’s six stages featured five different winners, with only Greipel winning twice. 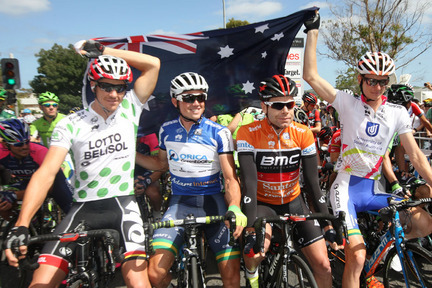 3 – Australian riders won all three odd-numbered stages: one (Gerrans), three (Evans) and five (Porte). Europeans won all the even-numbered stages. 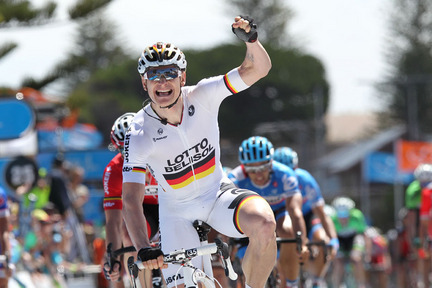 16 – Andre Greipel now has 16 career victories at the Tour Down Under. Robbie McEwen (12) is the only other rider to have reached double figures. Stage 1: Winner – Simon Gerrans (Orica-GreenEDGE). Leader – Gerrans. Stage 2: Winner – Diego Ulissi (Lampre-Merida). Leader – Gerrans. Stage 3: Winner – Cadel Evans (BMC). Leader – Evans. Stage 5: Winner – Richie Porte (Sky). Leader – Gerrans. Stage 6: Winner: – Greipel. Overall winner – Gerrans. Thanks for a great summary again, Tim. The TDU is always an interesting race, this year more exciting than most. It deserves more live TV coverage than it gets on free-to-air here, but interest in cycling generally is growing DownUnder. Thanks Richard, I really enjoyed this year’s race – a great parcours and some hard riding from all involved. I’m amazed it doesn’t get more coverage – it certainly deserves it. In the UK we got at least 90 minutes’ live coverage plus 2-3 half-hour repeats of highlights every day on Sky (our subscription satellite broadcaster).